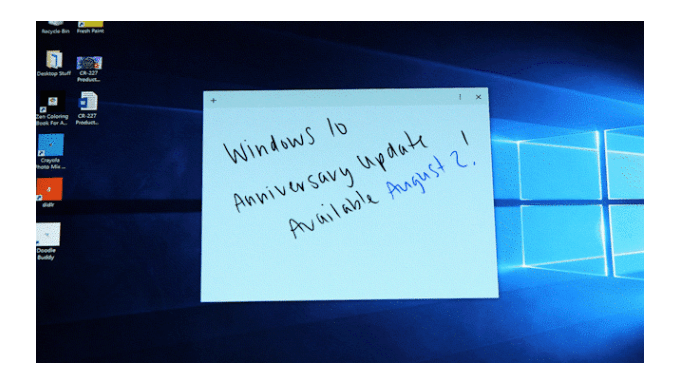 Anniversary Update for Windows 10 is scheduled to arrive on August 2nd 2016. Windows 10 announced by Microsoft in September of 2014 was released officially on the 29th of July 2015. A year on; Windows 10 currently available as a free upgrade to users of Windows 7, 8 and 8.1 PC’s will receive it’s second major update. The first major update was released some time back in November 2015. The Anniversary Update scheduled to arrive this summer, has been known by the codename REDSTONE for some time. Windows Insiders have also had the opportunity to help shape it’s development with their numerous feedbacks. But to all other Windows 10 users, the update will start rolling out on the 2nd of August. For users who have updated to Windows 10, this update comes as a free upgrade. If you buy a near future windows 10 device you will get this probably preinstalled. If you didn’t upgrade your old windows device then you’ll need to buy this. Windows 10 currently according to Microsoft is installed on over 350 million devices and 135 billion hours of usage since launch. The Anniversary Update brings six areas of innovation and improvements to consumers and enterprises. The Update enables companion devices to use Windows Hello to unlock your PC, giving you more choices for quick, secured sign-ins. Improvements to Windows Defenders free anti-malware service, includes the option to automatically schedule periodic quick scans of your PC; as well as provide new notifications and summaries when scans are complete and threats are found. Enterprise customers will benefit from two major new security features to help protect businesses from today’s modern threats. Windows Defender Advanced Threat Protection (WDATP) and Windows Information Protection, formerly referred to as enterprise data protection. Are you exited and looking forward to the new update? Let us know in the comments what you are most looking forward to.